How did Indian banking protect itself from the Lehman Crash? What nearly wiped out the MFI sector in India? Why are public-sector banks suffering from so many non-performing assets? What is the conflict between the RBI and the finance ministry? From Lehman to Demonetization is the epic story of banking in India in the last decade. The years from 2007–17 were the most tumultuous and exciting years of this sector. It saw D. Subbarao, Raghuram Rajan and Urijit Patel as RBI governors working with finance ministers Pranab Mukherjee, P. Chidambaram and Arun Jaitley. What a decade it has been-from India’s first MFI, SKS Microfinance, getting listed to the near death of the industry; the RBI giving the nod for twenty-three banks and becoming an inflation targeter; from 9 per cent economic growth for three years to the jolt of demonetization. These essays make for a riveting read. The book also features interviews with the who’s who of this sector, including Deepak Parkeh, K.V. Kamath, Arundhati Bhattacharya, Chanda Kochchar, Aditya Puri, Shikha Sharma, Raghuram Rajan, U.K. Sinha and Viral Acharya. 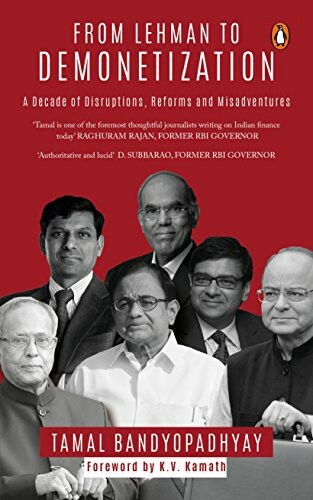 If you had to read one book on banking in India, this would be it!